Roller shutter made of galvanized steel 115mm wide. Roller shutter made of galvanized steel profile, 80 mm wide. Ideal for residential use. Roller shutter made of galvanized steel with hollow and reinforced 80mm wide profile. 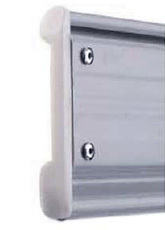 Roller shutter made of extruded aluminum profile, 1,5 thick. Roller shutter made of extruded aluminum profile, 1,5mm thick. Ideal for residential balcony doors and garage doors. 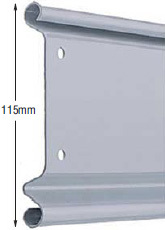 Insulated roller shutter, made of pre-painted aluminium panel, 0,5mm thick and 100mm wide. Roller shutter made of galvanized steel profile with hollow cross section 80mm wide and 1mm thick. Roller shutter made of galvanized steel profile 115mm wide and 1mm thick. Roller shutter made of extruded aluminum thickness 1,5mm. Suitable for covering large openings in industrial spaces, warehouses and garage spaces. Roller shutter made of special, high standard polycarbonate material with high transparency. Manufactured of galvanized steel rods, cross section 8mm. Roller shutter made of twin wall galvanized steel profile width 115mm. Insulated roller shutter, made of galvanized steel panel, 0,5mm to 1,5 thick and 120mm wide. Insulated roller shutter, made of galvanized steel panel, 0,5mm thick and 140mm wide. Metal fire safety roller shutters made of special steel profile with hollow cross section profile. Roller shutter made of galvanized steel, 115mm wide. Offers greater security with noise-free operation and aesthetics. Ideal for residential use, retail stores and industrial spaces. 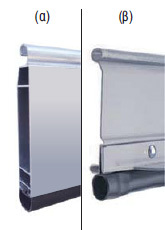 An elastomer PVC strip is attached to the aluminum (a) or steel (b) last profile (endplate) for enhanced sealing. Special polyamide cap at profile ends that reduces friction and noise. 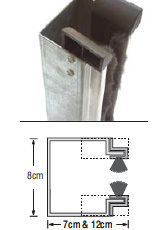 Guide made of 1,5 - 2mm thick, "Ω" shaped galvanized steel that works together with a special aluminum profile and brush strip to reduce friction and noise.